Here is what Julie had to say about her visit …..
My name is Julie Bowman and I’m a youth worker from the United States. I live in Indiana, a Midwest state near Chicago, and I work for a mentoring organization that exposes at-risk kids to higher education and careers. I visited the Horizons Theatre Company on the International Youth Worker Exchange from The Journey Fellowship of Indiana, USA to learn about youth work in Australia. I was impressed to see the materials and space the youth of Canterbury and Bankstown can access to express themselves at Horizon! I learned about nonprofits in Australia from Maddy Slabacu and compared and contrasted to my organization in the United States. 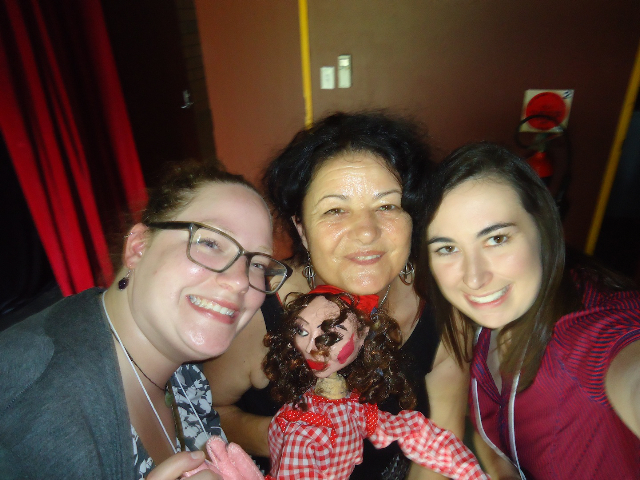 I learned about the varied ways that the theatre encourages local children and teens to express themselves and address social issues through puppetry and acting. I particularly loved learning that Horizons recruited some of its most loyal participants from the kids who regularly hang out outside of the theatre. Thank you, Maddy, for your hospitality! I loved Sydney and visiting you and the theatre! This is some feed back we got from a parent …..
” I am writing this email to say a very big thank you to Horizon Theatre Co for allowing my daughter to complete her year 11 work experience at your theatre. She is a year 11 student who attends Georges River College Oatley Senior Campus and is studying Entertainment at school. The students are required to complete a week of work experience and she attended your theatre last week. At Horizon Theatre we also offer work experience for young people and are dedicated to working with the community. Whilst completing work experience with us you will learn lots of different elements of live theatre and puppetry. You will also have the opportunity to work “behind the scenes” and assist with lighting, costumes and creating props. Horizon Theatre is a great place to learn different elements of theatre so contact us today!